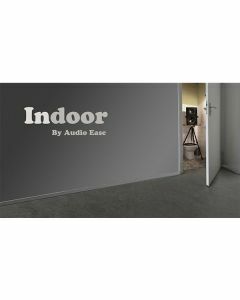 Indoor is Audio Ease's flagship convolution reverb for Audio Post. Indoor features unprecedented sound quality, flexibility and ease of operation, AAX DSP support, click-free automation, zipper-free motion and up to nine channels of reverb, in a single resizable window without tabs. Indoor can take your studio recordings from understated to overdone, always remaining stunningly real. So that hearing is believing. Every room, hallway and kitchen from 10 houses and vehicles, 60 spaces sampled from every angle. Click to drop speaker and microphone in any room, or to open and close doors. Not only the 60 rooms have been sampled but also any-room-TO-any-room is available. Over 1000 impulse responses, everything recorded in 9 channels with a consistency and quality never before presented. The microphone system can turn, creating seamless, zipper-free and automatable motion in any surround track up to 7.0 plus Dolby Atmos, fully supporting new immersive audio requirements. Or insert a 7.0 to 7.0 Indoor in a bus and pan sounds into it. Use the Spread knob to tighten the reverb around each incoming source, dynamically following its panning. That’s Input Pan Following Reverb and its zipper-free. Inside is a completely new convolution engine focused on impulse response changes that are click-free, zipper-free and instant, and they cause no CPU spikes. Pre-roll for IR switches is no longer necessary and neither are multiple instances to cover up switches. Use the AAX DSP version of Indoor to drop the CPU Load and reduce latency to a millisecond and a half. You can load 3 mono to stereo Indoors on a single chip. No Indoor uses more than 1 chip. AAX DSP is available up to 48 kHz and for up to 1-in 7-out, or up to 5-in 5-out. Easily switch between the two main surround microphone systems: Baffled Omni-directionals (AB) or Mid Side (MS), or combine them to create 7.0 DTS. Add two ceiling channels (for Dolby Atmos®) to get to a total of 9 channels of real decorrelated reverb channels. There are no tabs or browser windows. The window can be resized and presets are there for super quick operation. CPU load is lower than you’d expect, and because of the zipper- and click-free instant switches you will use less instances than you are used to. Indoor more than doubles the domestic and vehicle categories of impulse responses available so far. Everything recorded with the same top quality system, so mixing and switching acoustics is more trouble-free than ever.